Thank you for once again choosing to read my writing. Let me finish my Pop-Tart so I can start this latest Thursday Rundown. #CCU Guest Snapper – With our Snapchat account here at Coastal Carolina booming, I decided to let our students get in on the fun as well. This week I introduced our #CCU Guest Snapper program. Each day I have allowed a different student to completely takeover our Snapchat account from 8 a.m. to 5 p.m. I chose the lucky five through an application process. I then had them agree to a contract and met with them personally to set ground rules prior to letting them loose. The first four days went well as the students all brought out their own personal Snapchat touch. I am excited to see what our final Guest Snapper brings to the table on Friday as I know he has big plans! 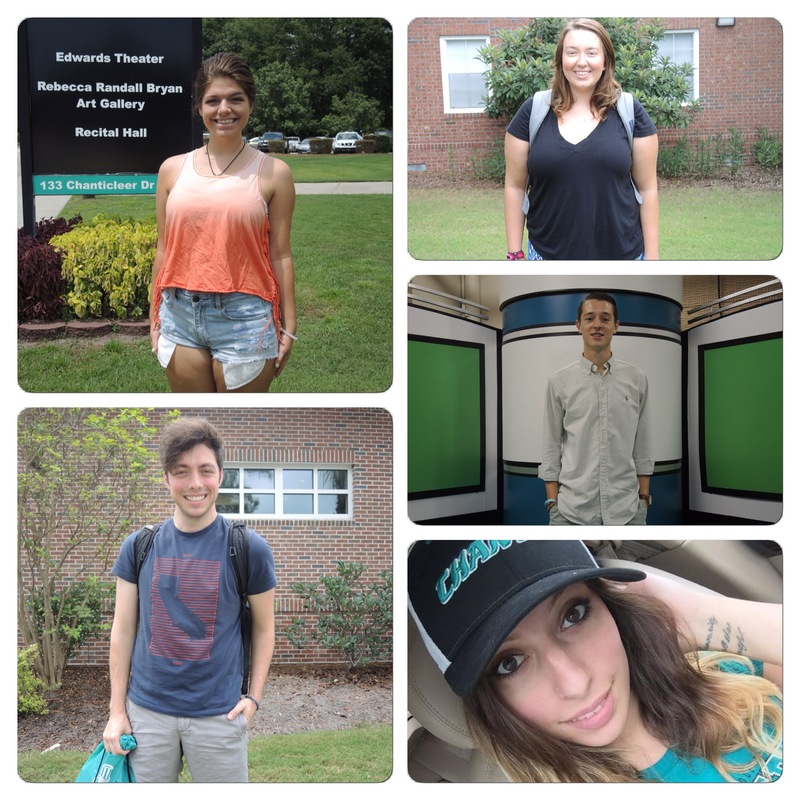 A look at my five #CCU Guest Snappers. Big FCS Showcase – This Saturday, the college football season kicks off. The best time of the year starts with an ESPN matchup between two Football Championship Subdivision (FCS) heavyweights. The Montana Grizzlies will host the North Dakota State Bison in front of a national television audience with Brent Musburger and Jesse Palmer calling the action. This type of exposure is incredible for the overlooked FCS, the division that Coastal Carolina plays in. Of course my enthusiasm for this game is heightened because I get to watch the Griz play. As I worked in the University of Montana athletic department previous to my time here at Coastal, I am still very supportive of the program up in Missoula. For those who love an amazing game atmosphere, make sure to tune in at 3:30 p.m. ET on Saturday as Washington-Grizzly Stadium is truly a one of a kind venue. I had the privilege of helping to put on the Gameday Experience while at the University of Montana. 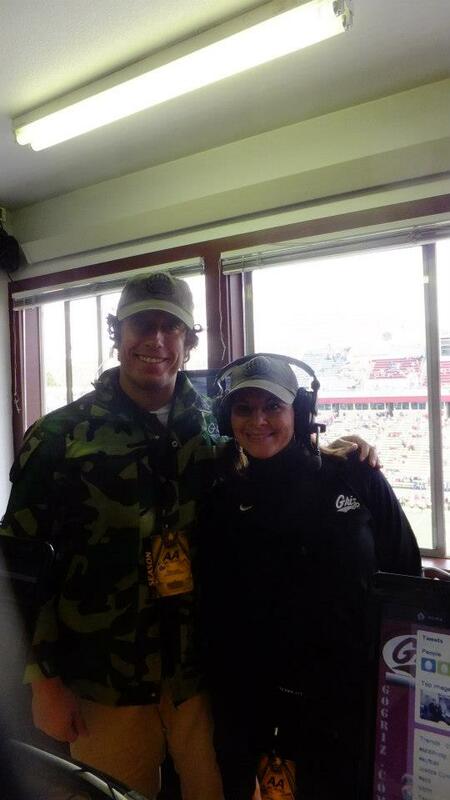 This is Christie and I up in the control room of the press box on Military Appreciation Day. Proposal Disaster – Oh man this made me sick to my stomach. A guy proposed to his girlfriend in a very similar way I did, on a pier overlooking the water as dusk started to set in. When he got down on one knee and opened up the box the ring fell out, slipped through the cracks, and sunk into the ocean. You better believe that this scenario went through my head more than a few times when I was planning my proposal. I think the situation even showed up in my nightmares. I will let you read the news story to find out how the situation was resolved but let me say this…I would have done a lot more for those Good Samaritans than just buy them a round of shots. 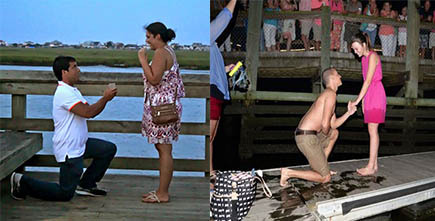 I am so glad I was luckier than the guy on the right and didn’t drop the ring into the water. Club Recruitment Day – At the beginning of each semester, Coastal Carolina University holds Club Recruitment Day out on Prince Lawn. A day for student groups to showcase what they have to offer and recruit new members, it is one of the busiest afternoons at CCU during the year. With such a prominent event, adequate social media coverage is necessary. As I did previously, I set out to take a photo of every single group with a table on Prince Lawn. I was successful, taking photos of 100 different groups. With heavy rains that switched off with periods of high humidity and scorching sun, I was drenched with both sweat and rain when I left the event. 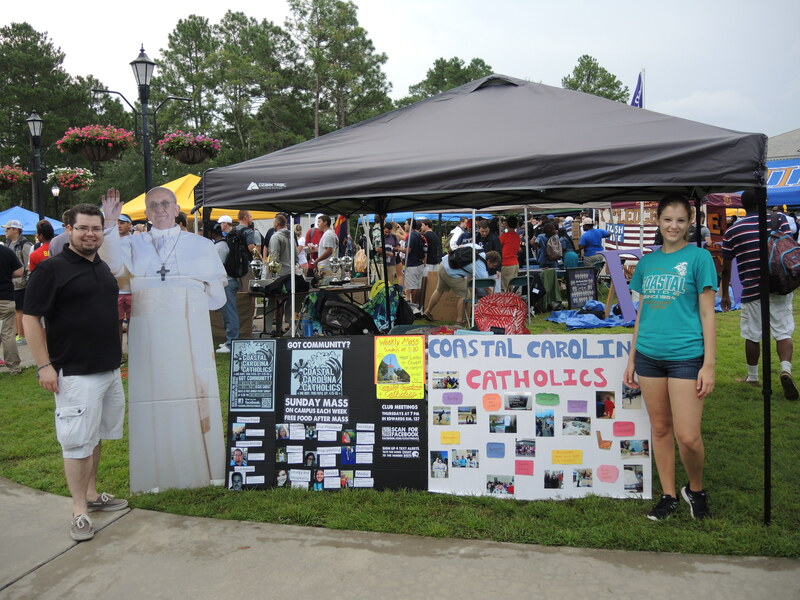 I personally got a kick out of the Pope Francis cut out that the Coastal Catholics group brought with them. Wedding Update #8 – I am told this one is a big deal…Sidney has picked out the bridesmaid dresses! Hopefully she doesn’t make me wear one. In other news, earlier this week my parents went ahead and bought airfare for the big wedding week! Thank you to God for blessing me with a great life, wonderful loved ones, and dedicated readers. You all have a terrific weekend. Don’t Blink. This entry was posted in Uncategorized and tagged Club Recruitment Day at Coastal Carolina, Coastal Carolina University, Montana vs. North Dakota State, wedding proposals gone bad by brent. Bookmark the permalink. Thanks for eating a Pop Tart first- LOL!!! love your blog!